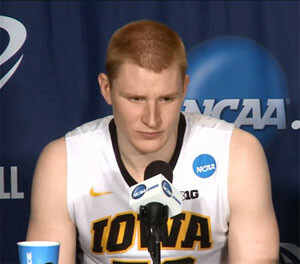 The next goal for former Iowa standout Aaron White is to make the roster. White was selected in the second round of the NBA by the Washington Wizards with the 49th selection. White watched the draft in his native Ohio. “I broke down when I was picked and everybody else in the room broke down…just a culmination of hard work…just amazing,” White said. The Iowa coaching staff made the trip to Ohio to watch the draft with White and his family. White says it meant the world to him to have the coaches there as the coaching staff is busy, and he says it shows how much they care about him.